Description: The flowers are 2/3 inch (1.5 cm) across and have 5 rounded petals with yellow at their base. 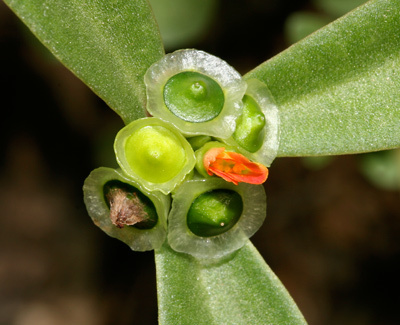 The flowers are followed by lidded seed capsules that are encircled by crown-like, pale green, translucent, membranaceous wings. 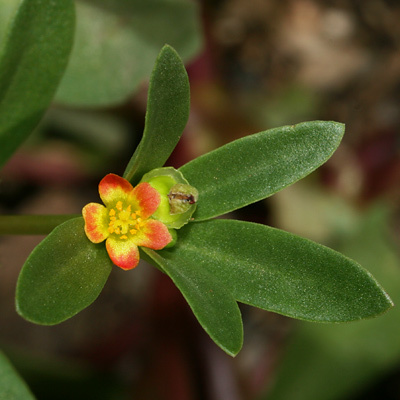 The leaves are green, succulent, and linear to spatulate in shape. The stems are fleshy, hairless, often reddish in color, and prostrate, ascending, or erect. The roots are fibrous.